Destin is known as the Luckiest Fishing Village, a designation that Shawn Purvis came to believe first-hand while on vacation here. While out paddle boarding the crystal clear flats of Choctawhatchee Bay, Shawn spied a school of tailing Redfish. Fishing rod in hand he cast ahead of the school - so as not to spook them - and waited for one to take his offering. The fish struck with a vengeance. Feeling the tension of the line the fish began a bulldog run; Shawn’s drag on his reel went into overdrive, emitting the music of every fisherman’s dreams. After fighting for some time, Shawn pulled up a gorgeous trophy Redfish, complete with a perfect black spot and bronze tinge. 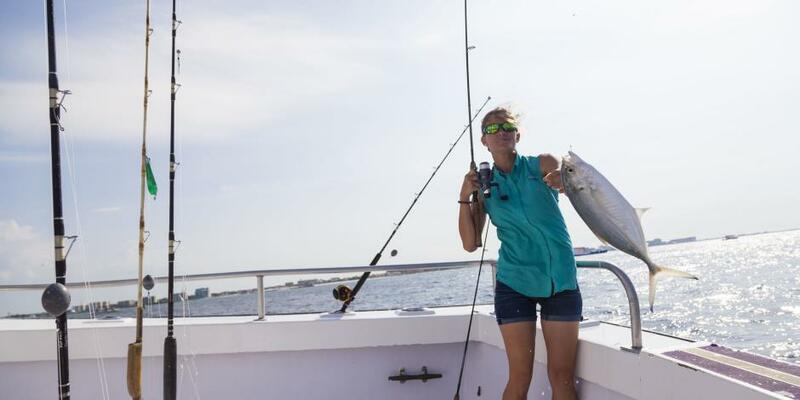 For those who don’t bring their own boats, Emerald Coast anglers can try their luck for native species not only on paddleboards, but on charter trips, fishing piers, and surf fishing along the beautiful white sugar-sand. Are you ready to find out why our anglers are so lucky? You can fish anywhere – literally – in Destin, Fort Walton Beach, and Okaloosa Island. Something is always in season, and always biting, in the Destin, Fort Walton Beach, and Okaloosa Island. 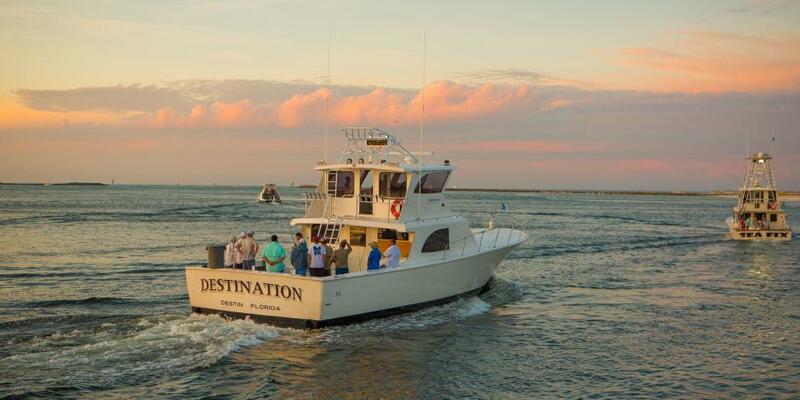 Destin harbor has the largest charter fishing fleet in the country, so you’re guaranteed to find a great ride out into the deep waters of the Gulf of Mexico. Visitors can choose smaller charter boats or bigger party boats that carry up to 60 people. Try bottom fishing for Red Snappers, Groupers, and Amberjacks, or troll for King Mackerels and Tunas (inshore), or Blue Marlins and Sailfish (offshore). When you reach the docks with your catch, take fresh fillets to participating Gulf to Table restaurants for chefs to cook your catch to order. There is nothing like the taste of a fish you brought in yourself! Find Gulf to Table restaurants. The Okaloosa Island Fishing Pier provides incredible views and awesome fishing opportunities for experts and beginners. 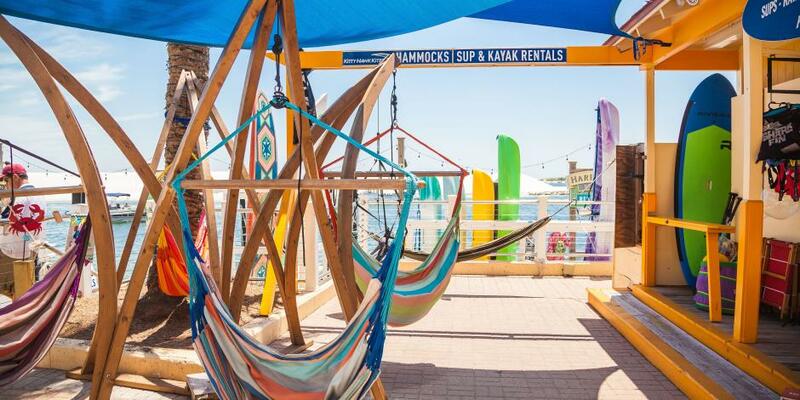 Equipment is available for rent, or you can bring your own! As an added benefit for those wishing to try out fishing for the first time: no Florida fishing license is required. The pier stretches over 1200 feet into the Gulf of Mexico, so walkers and anglers can look for dolphins and sea turtles while they fish. Ladyfish, Spanish Mackerel, Black Snapper, Whiting, Sailfish, Yellowtails, and so much more have been caught from the pier; click here for the daily fishing report. Fishing from the beach can be one of the best ways to fish with family, as local parks include facilities as well as miles of fun beach activities. Spring is the best time to catch Pompano, which usually range from 2-3 pounds. In the fall, look out for Redfish, which are delicious (though they must be between 18 and 27 inches long to keep). In the winter, try for Whiting, which are usually found close to shore. Anglers can also try for Hard Tails, Bluefish, Ladyfish, Black Drum, catfish, and even rays. Visitors and locals alike can celebrate fishing along the Emerald Coast in the annual Destin Fishing Rodeo. The competition is held throughout the month of October, with amazing events and prizes.